On a spring Saturday in an old farmhouse near Fort Saskatchewan, just northeast of Edmonton, the set for Cold Comfort is anything but cold. In fact, thanks to warm weather and the room being full of crew, lights and other equipment, it’s sweltering. Being in the attic doesn’t help. Brandon Rhiness (Radio and Television ’00), Katie Gobert (Digital Media and IT ’13) and Mike Schaar-Ney (Electrician ’07) modified the space to look like a small basement room. The film’s protagonist wakes up locked inside with no recollection of how she got here. She has to use her wits to escape her kidnappers. Written by Rhiness, who has penned several short features and web series including The Man in the Box and I’m in Love With a Dead Girl, the film is equal parts creative exercise and hands-on learning experiment. He and the team hope it’s their springboard into making more full-length features, and moving them, as a band of independent filmmakers, from concept to distribution right here in Alberta. Now in post-production, Cold Comfort has shown them it’s possible. It’s also shown, however, that it’s not easy. 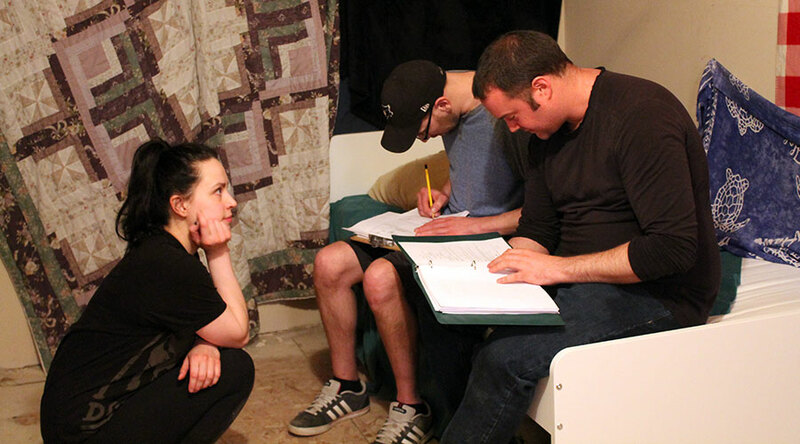 Despite writing a script involving a single set, a skeleton crew and only one on-screen actor, the trio quickly learned how much even low-budget films can cost. Funding is among the top challenges for emerging filmmakers. According to Michael Jorgensen, NAIT Digital Cinema instructor and current chair of the Alberta Media Production Industries Association, it can be an obstacle in Alberta, which offers support through grants, investing about $45 million annually in the industry. The return is about six to one. “The issue with the Alberta pot of money is … it’s less than a tenth of what British Columbia puts in,” says Jorgensen. What’s more, projects need to have a minimum budget of $100,000 to qualify. For local filmmakers who work with less than that, financial support is limited to programs like Telus Storyhive, grants from organizations such as the Alberta Foundation for the Arts, personal funds or crowdfunding. While Gobert and Rhiness’s short film 'Kay, thx, bye!, now in pre-production, was funded by Storyhive in 2018, Cold Comfort is financed mostly through the team’s own savings, supplemented by an Indiegogo campaign that ended earlier this spring. Rhiness says that crowdfunding tends to be challenging. Between the campaign and a fundraising event, they were able to raise about 20% of their budget. In spite of funding challenges, making movies in Alberta, and Edmonton in particular, has perks. One is the relatively low cost of living. “I’m actually able to make my living as a screenwriter now because my rent’s fairly cheap,” says Rhiness. There’s also the community support. For example, the house in which Cold Comfort was shot was provided for free by its owner, the City of Fort Saskatchewan. But across the Edmonton area, “There is an amazing group of people in all the different aspects of film that are ready and willing to be a part of new projects,” Schaar-Ney says. Judging by Rhiness and the team’s approach, the secret to success in this industry may be to never stop producing. “We have a lot of stuff on the go and we keep getting more,” says Rhiness. In addition to 'Kay, thx, bye! they have another feature film called Hotel 13 in the works, as well as several other projects, including film production for clients. Once Cold Comfort is finished post-production and ready for screening before the year’s end, another phase of work will begin: getting people to warm to Cold Comfort. It will be Schaar-Ney’s job to “get people interested in it,” he says.